Despite yesterday’s snow, the weather is back in the 50’s and the feeling of freshness is in the air, along with the blooming trees and rising spirits. 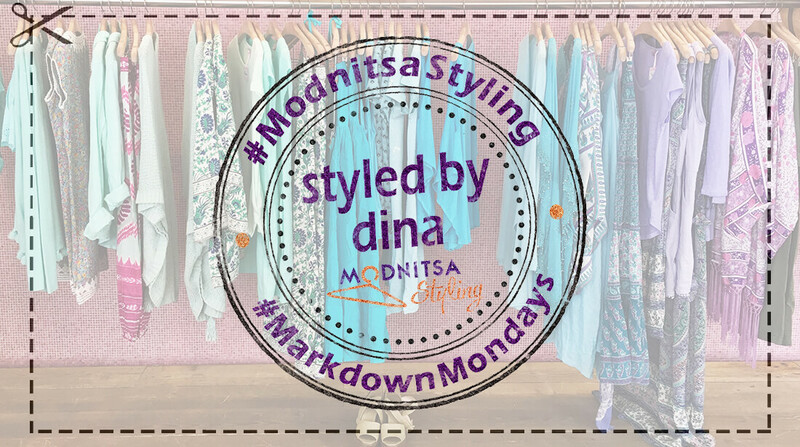 This week’s #MarkdownMondays brings you some light and airy pieces in a mini-capsule wardrobe of sorts, that can take you though your days and evenings with a variety of looks for the office and the weekend. We start building the mini-capsule with this white and blue polka-dot Camila Two Chiffon Dress by DVF. From there, we add a pair of timeless Sloan Fit Slim Ankle Pants from Banana Republic in black. These pants are universally flattering with their cropped fit, drawing attention to your ankles (which are the narrowest part of your leg) and tapering off towards the bottom, creating a long silhouette. They can pair easily with a tucked-in or untucked blouse, a sweater, a cardigan or tank top – and can be polished off further with a blazer and heels, or worn with flats for a more casual occasion. As any good capsule will require, we also have a pair of black booties – and these Nina Payne Halsey ones from Anthro are very special with their gold and black leather and stable yet classy heel. 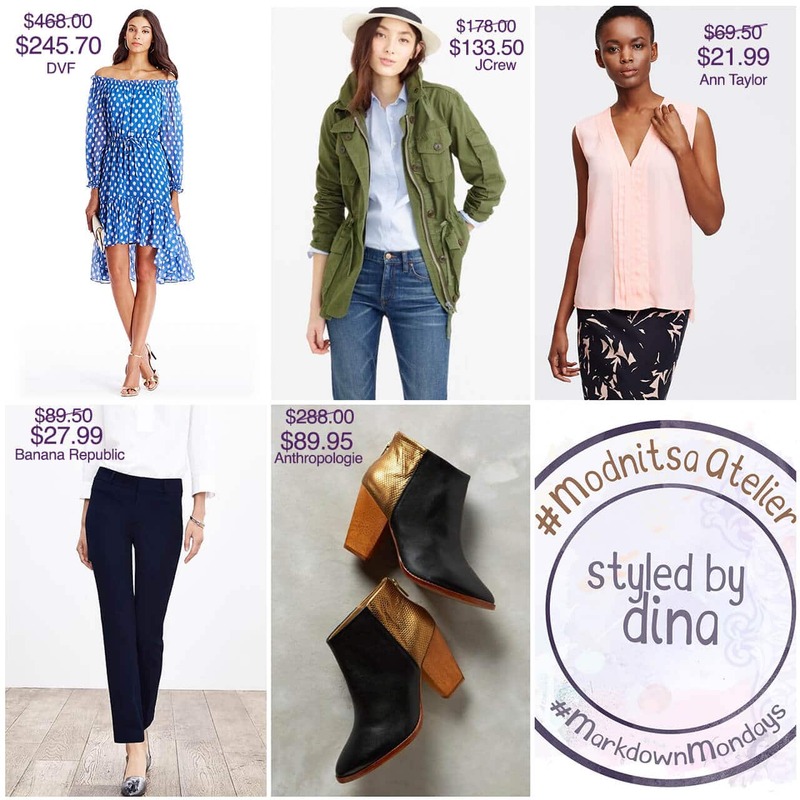 This budgeoning peony pink pleated shell from Ann Taylor is pretty and versatile and the Field Mechanic Jacket by JCrew in a utilitarian and practical hillside green adds a bit of an urban touch to your outfits, while providing the necessary wind protection for mid-season weather. Styling Tip: when creating a mini-capsule (which are perfect for travel), choose at least 1 or 2 neutrals in your core pieces (i.e. pants or jackets) as you’ll be wearing them with a multitude of other options. Then add playful tops or dresses and a universally-flattering pair of shoes “to boot” that can be both comfortable and polished. All you need then is some jewelry and makeup to make the looks feel fresh & different for varying occasions.